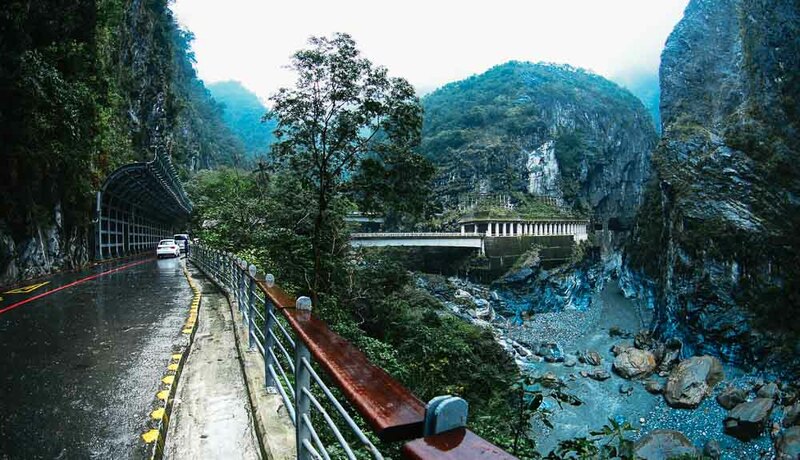 The Taroko Gorge resides in the Hualien region and spans over three counties. We had the pleasure of driving through from one end of the island to the other. 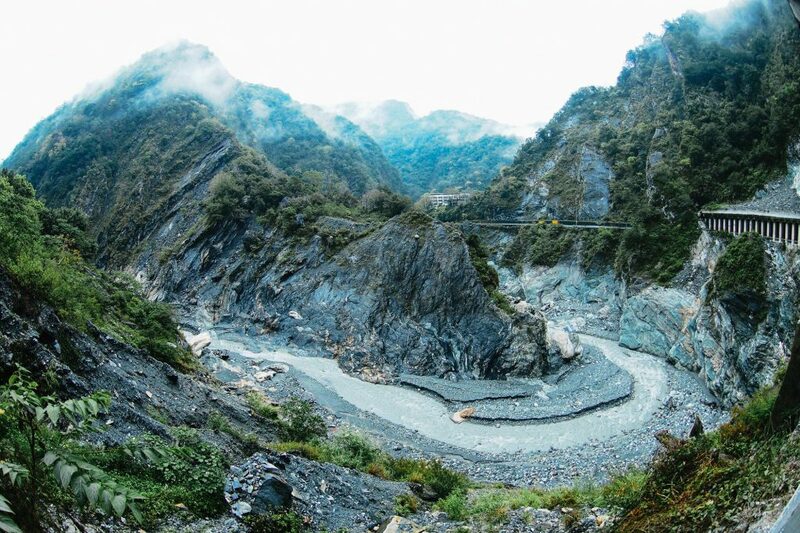 It is considered by many experts to be one of the most dangerous roads in the world. So, we forked out a couple extra bucks to hire a hot hatch. 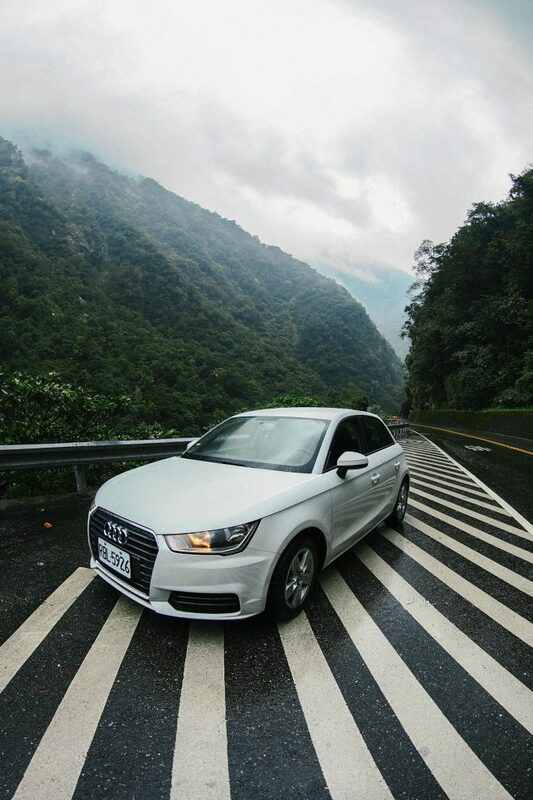 I present our quick and nimble Audi A1. Armed with my new 8mm f/3.5 Panasonic fisheye, a 75mm f/1.8 Olympus, and my trusty Huawei P9 smartphone’s dual leica cameras, we set off to conquer this mountain pass. 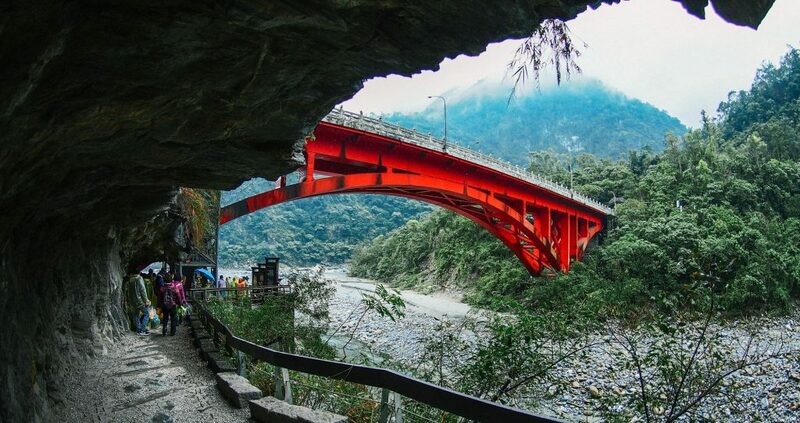 It is about a 20 minute drive from the Hualien Train Station and AVIS car rental office which are beside each other. 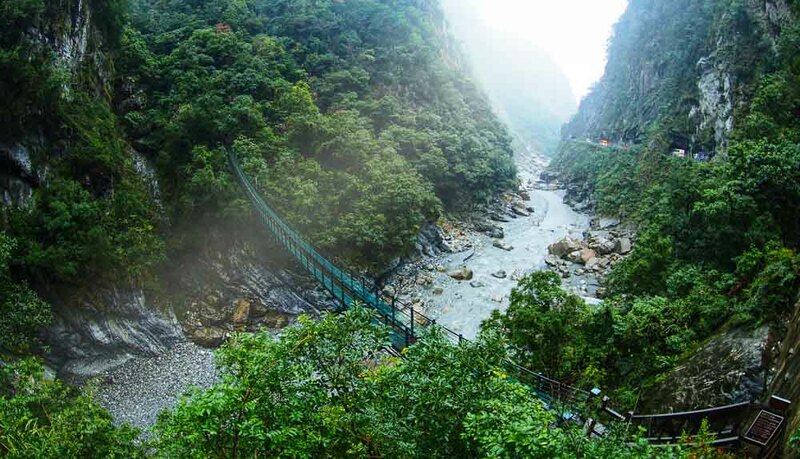 You are greeted to a rather spectacular entrance to the Taroko Gorge with sloping mountains on both sides with wonderfully saturated green moss-like flora. 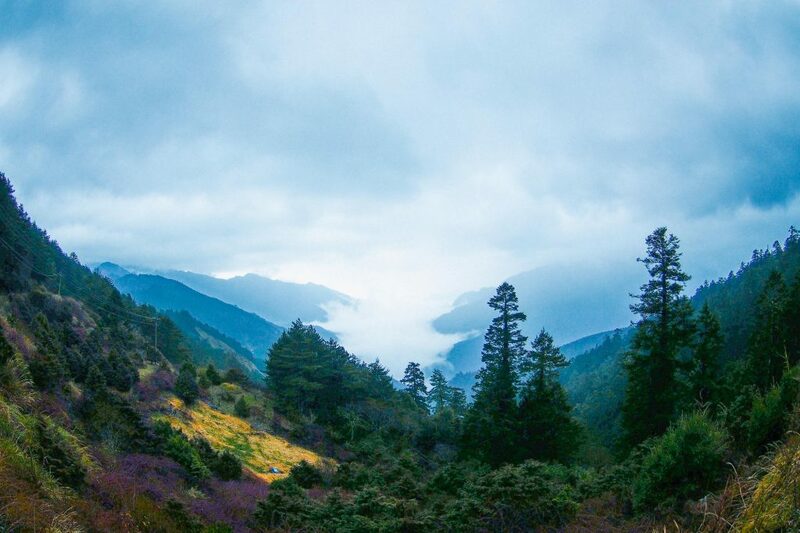 No further than 10 minutes down the road is the famous Shakadang Trail. From the car park, walk along the bridge until you get to the trail entrance. 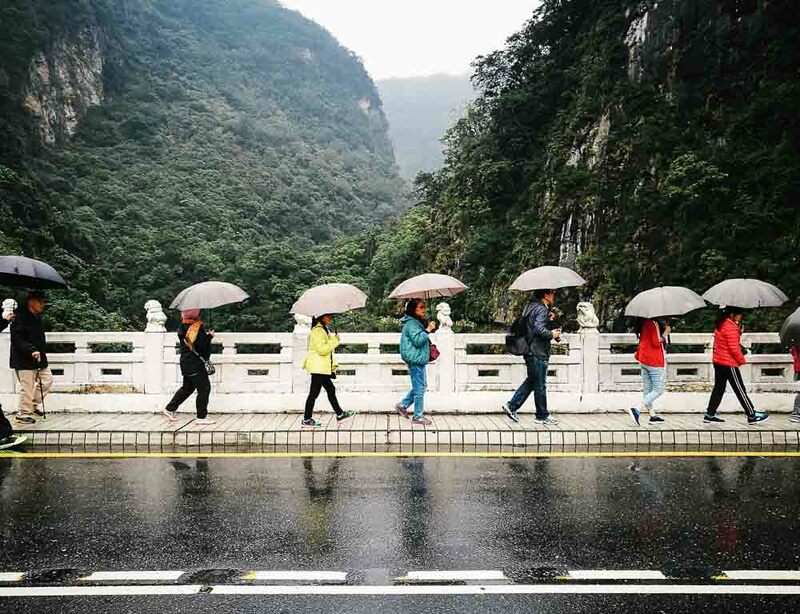 It was unfortunate that it was intermittently raining all day while we were visiting. However, that in turn ensured that everything was gorgeously saturated with amazing reflections everywhere. In addition, the low clouds and constant breeze made for some very dynamic shots. 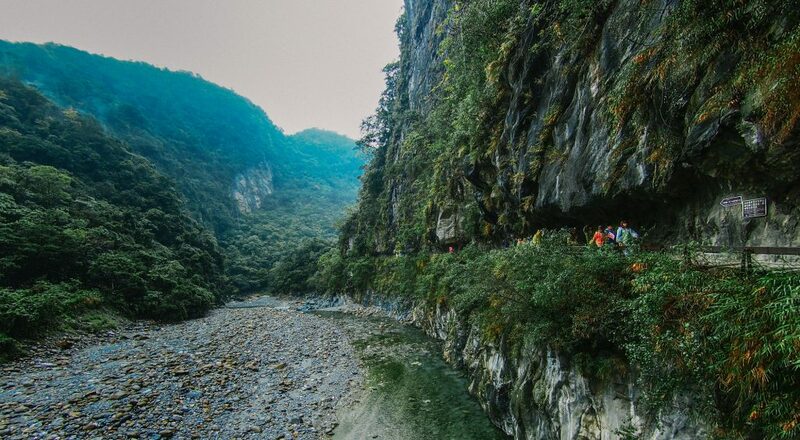 This naturally phenomenon has carved a walkway within the rock formation to allow visitors to hike inside and under the shelter of the rock itself. Besides this, there are a bunch of other hiking trails, hot springs, scenic lookouts, and winding hairpin turns. 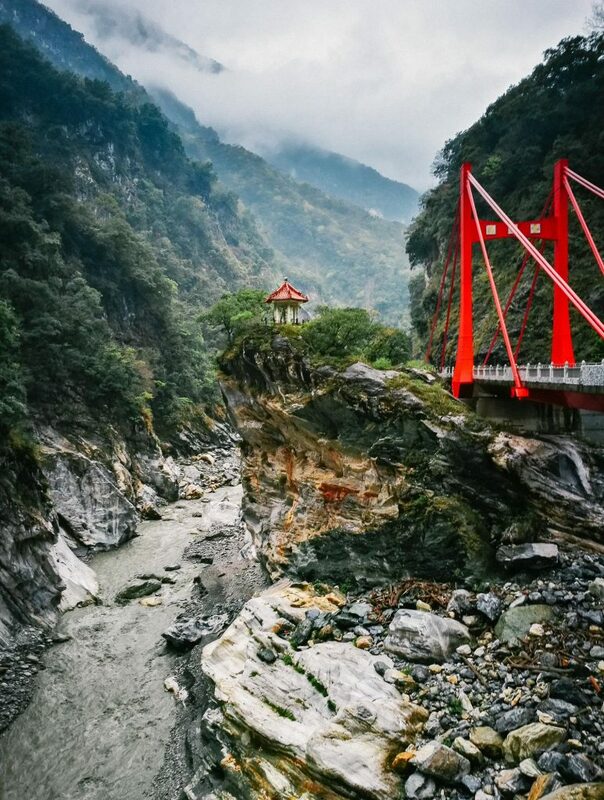 The Chimu Bridge is a distinct landmark with a bright red paint flanked by two identical pagodas. 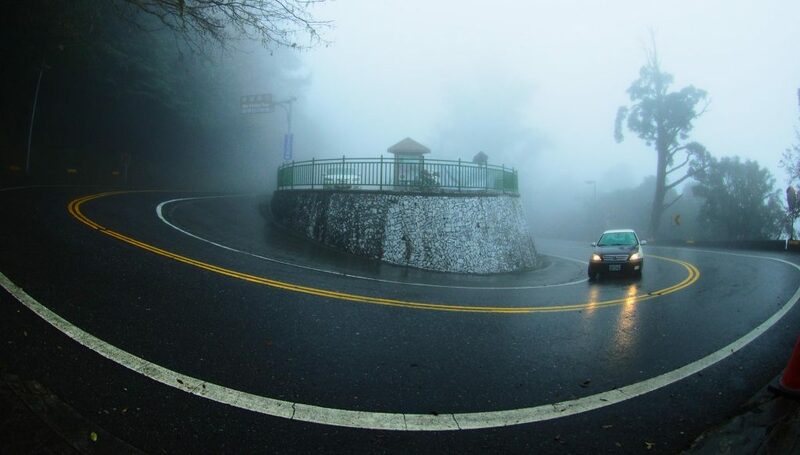 The road opens up as you approach the bridge and appears to disappear into the cliff it sits on. 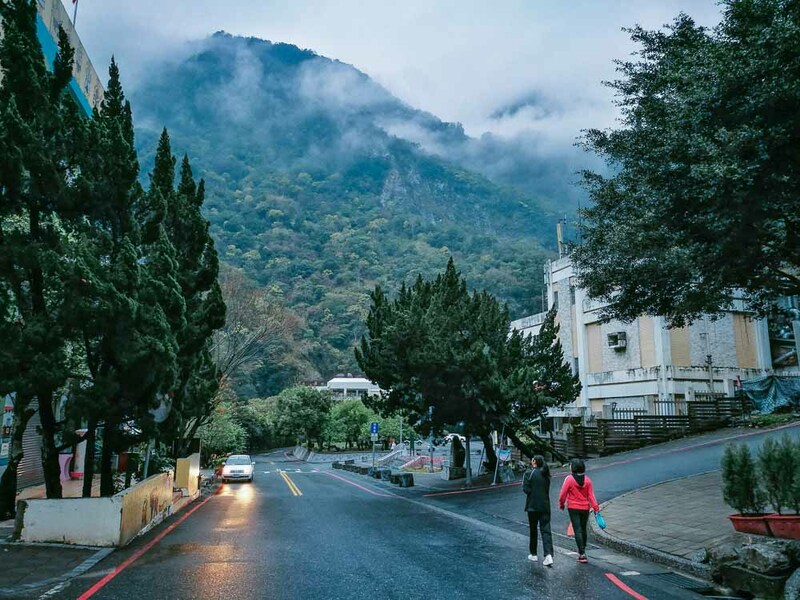 Driving along this single road will eventually lead to Tianxiang – a glimmer of civilization within the natural walls of the valley. It is home to some accommodation options, a fuel station, and some restaurants. 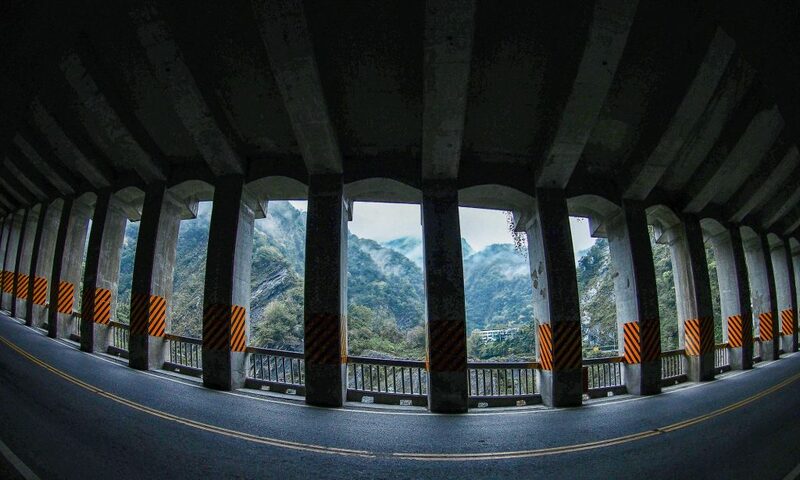 Among these reside Silks Place Taroko – the only 5 star luxury accommodation within the vicinity. Unfortunately for us, the time was not on our side so we couldn’t hike the trail as initially intended. Having said that, the entrance is a sight to behold in itself. It is so close to Tianxiang that one could walk to the entrance within 15 mins. 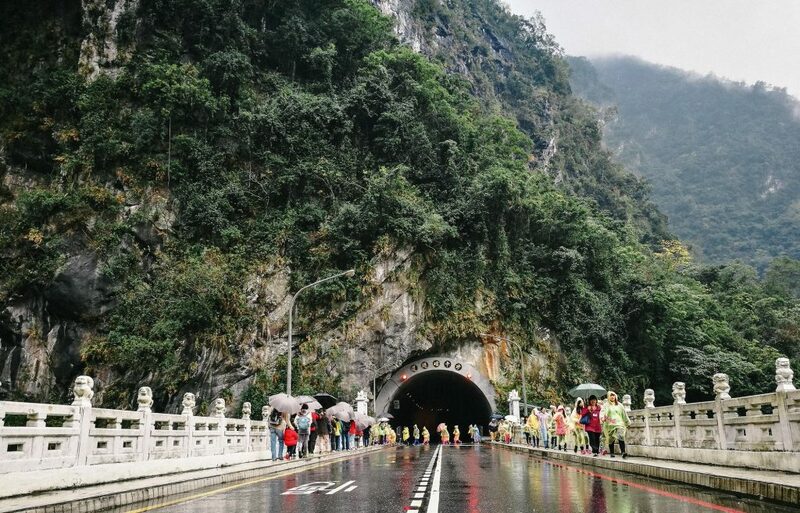 The entrance resides within one of the carved tunnels in the mountainside and sits just behind a hairpin bend. There is a parking lot just a few meters from the entrance for those in a little more of a rush. 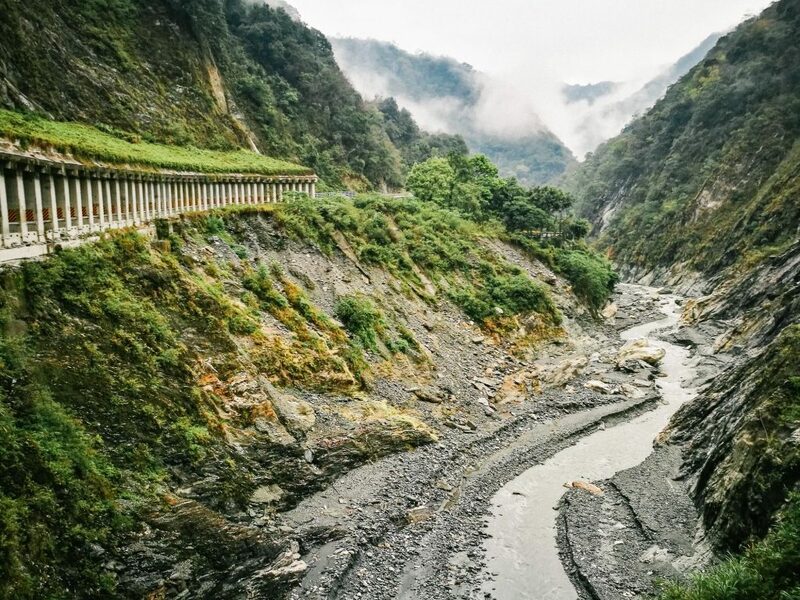 From there, the road gradually inclines to its max elevation of 3400 meters. Somewhere along the way is a cafe with a sign that says ‘Bilv Devine Tree’ at an elevation of 2150 meters. You can’t miss it. Do yourself a favour and try their famous red tea. 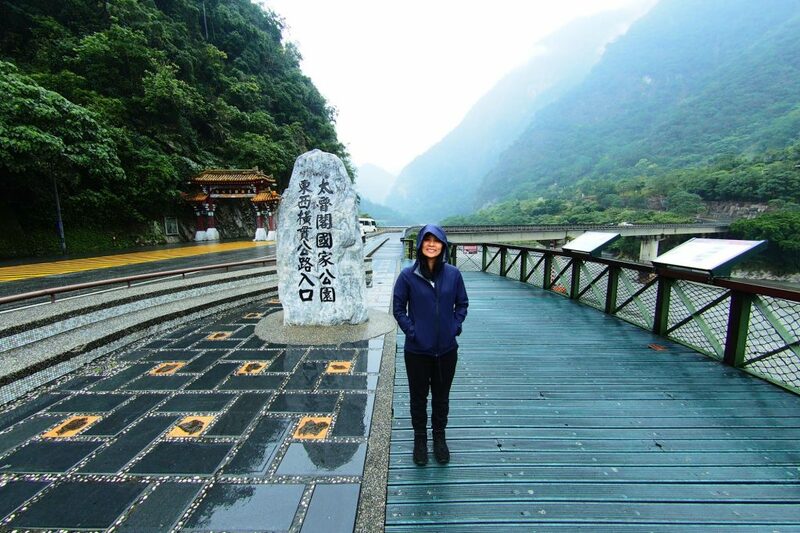 Finally, after hours of heavy footed driving while still averaging <40 km/h we arrive at the border of the Hualien and Nantou counties. It is also marked by the elevation being close to its highest peak. 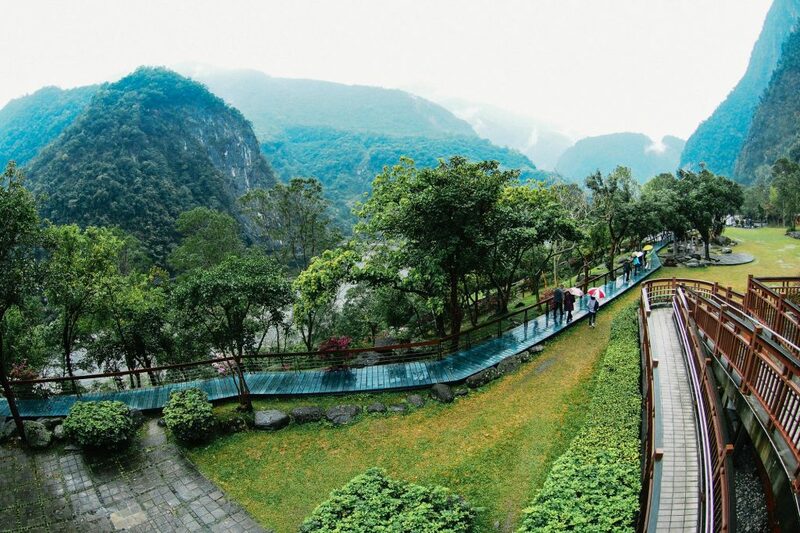 While on our trip, we decided to stay at the Silks Place Taroko. It was decided very early on that it would be our ‘splurge’ hotel of the holiday…and boy, did it deliver. Read my post about it here.